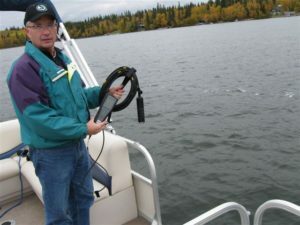 The Water Quality monitoring program is carried out during the open water season following the same monitoring and sampling plan used since its implementation in 2011. The prime program objective of this monitoring program remained unchanged which is to ensure compliance with Saskatchewan Surface Water Quality Objectives for Recreation and Aesthetics and for the protection of Aquatic Life. The secondary program objective is to gather baseline physical and chemical parameter data that can be used for comparisons over time to determine trends and to monitor any parameter changes. In addition to the funding provided by the District, generous monetary support was received from the Anglin Lake Cottage Owners Association and the Emma & Christopher Lakes Association.